In the 1992 presidential election, Bill Clinton's campaign reduced everything to one talking point, saying "It's the ECONOMY, stupid!" If you learn one thing today about how we can calculate dates for End Times Bible prophecies, remember: "It's the ASTRONOMY"
Many verses like Luke 21:25 tell us: "There will be signs in sun and moon and stars." Despite a widespread misunderstanding* of Matthew 24:36, leading many English-speaking Christians to believe that we cannot know the hour or the day - the truth is that the Bible gives us numerous astronomical clues which allow us to pinpoint the timing of End Times events. *(Very briefly: the Greek word "oiden" was slightly mistranslated into English as "knows" when it is really a past tense verb and should be read as "has known" - a huge difference which really means that although humanity, and even Jesus Himself - prior to the Resurrection - had not known the timing - the verse should not rule out that knowledge will increase in the future. As Luke 8:17 says, "For nothing is hidden that will not become evident, nor anything secret that will not be known and come to light." As Daniel was told in Daniel 12:4 and 12:9 "knowledge will increase... these words are concealed and sealed up until the end time." 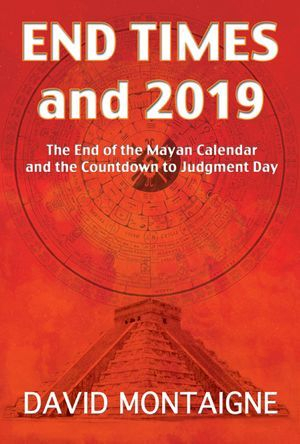 A deeper explanation is given in the book, "End Times and 2019.") You can also read an independent detailed explanation from truebiblecode at the link here:here or on the FAQ page link above. The Bible does not waste much time before telling us to use astronomical clues to time future events. We need look no further than the first chapter of the first book of the Bible. It may, depending on your copy, be on the very first page. Genesis 1:14 tells us "let there be lights in the expanse of the heavens to separate the day from the night, and let them be for signs, and for seasons, and for days and years." Lights in the heavens should be used for signs, for the night sky can be read like a giant clock and calendar, if you understand how to tell time on it by noting the positions of various heavenly lights. Nostradamus attributed his ability to date future events to "the just integration of Holy Scriptures and visible celestial bodies." The famous astronomer Isaac Newton attempted to calculate the end of days the same way (but never finished narrowing down his time frame better than "the 21st century." With computers, he could have reached 2019...) Don't ignore the astronomical descriptions and strange numbers in the Bible. Luke 21:25 also comments that just prior to the return of Jesus, "There will be signs in sun and moon and stars." Just as there were with the "Star of Bethlehem" that allowed the 3 Magi (Persian astronomers) to calculate His birth. In Matthew 16:3 Jesus hints that if you know what to look for in the sky, you will know how to time such events: "Do you know how to discern the appearance of the sky, but cannot discern the signs of the times?" For most people (especially if they have wrongly been led to believe they cannot know the timing of future events) Judgment Day will come by surprise, like a thief in the night. 1 Thessalonians 5:1-4 tells us "Now as to the times and the epochs, brethren, you have no need of anything to be written to you. For you yourselves know full well that the day of the Lord will come just like a thief in the night. While they are saying, “Peace and safety!” then destruction will come upon them suddenly like labor pains upon a woman with child, and they will not escape. But you, brethren, are not in darkness, that the day would overtake you like a thief." We are told here that we can understand, we can know when events are coming, and we will not be surprised by timing and overtaken like "they" and "them" who do not understand astronomical references and will be surprised by the timing as if robbed unexpectedly by a thief in the night. Revelations 3:3 warns us "if you do not wake up, I will come like a thief, and you will not know at what hour I will come to you." This clearly implies that if we have woken up (are knowlegeable and thinking and watching for signs) that He will not come like a thief (it will not be secret and stealthy and surprising to us) and we WILL know at what hour He will come. Luke 21:36 "But keep on the alert at all times, praying that you may have strength to escape all these things that are about to take place." If we watch, we may escape the devastation. Evidence in sediments, corals, lava flows, monuments, myths, and religion all point to the fact that roughly every 6,000 years, the Earth experiences a devastating shifting of the poles. The surface of the planet is completely reoriented; latitude and altitude change, with earthquakes and tsunamis killing most of the population. Civilizations are destroyed and knocked back almost to the stone age. The book of Genesis describes the last time. The book of Revelations describes the next time. And that time will occur in December 2019. More specifically, a pole shift will start slowly and accelerate over the span of a week, with most of the panic from 12/21-12/27 but with most of the destruction on the final day, Judgment Day, December 28. 2019. Along with many other scriptures, Isaiah 24:1 clearly describes a shifting of the poles: "Behold, the Lord lays the earth waste, devastates it, distorts its surface and scatters its inhabitants." Job 9:5-6 "It is God who removes the mountains, they know not how, When He overturns them in His anger; Who shakes the earth out of its place, And its pillars tremble." Revelations 6:14 tells us "The sky was split apart like a scroll when it is rolled up, and every mountain and island were moved out of their places." Isaiah 22:25 "'In that day,' declares the Lord of hosts, 'the peg driven in a firm place will give way; it will even break off and fall, and the load hanging on it will be cut off.'" The peg in a firm place is the North Pole, and it will move, and the Earth and sky will appear to fall. Isaiah 13:10 comments on signs just before the Day of the Lord "For the stars of heaven and their constellations Will not flash forth their light; The sun will be dark when it rises And the moon will not shed its light." A solar eclipse visible at sunrise in the Middle East would make the sun dark as it rises, with no moonlight. Isaiah 13:13 "I will make the heavens tremble, And the earth will be shaken from its place." Colossians 2:16 "no one is to act as your judge in regard to food or drink or in respect to a festival or a new moon or a Sabbath day — things which are a mere shadow of what is to come." Because the greater judgment - Judgment Day - will come at the time of a festival, a new moon, and a Sabbath day. December 28, 2019 is a week into the Festival of Hannukkah, the Jewish celebration of the rededication of the Temple. The first sliver of the new moon will be visible. It will be Saturday, the Sabbath. John 10:22-30 "At that time the Feast of the Dedication took place at Jerusalem; it was winter, and Jesus was walking in the temple... I and the Father are one." The center of the galaxy symbolizes God Himself, and at this time the winter solstice sun (Jesus) is in alignment with the center of the galaxy (God) sharing the throne in the Temple during Hannukah at the beginning of winter. The skies also line up appropriately exactly 75 days prior to Judgment Day for the Second Coming. The sun, representing Jesus, is at exactly the right position in Virgo (the virgin) on the Feast of Tabernacles - when Christ should return to tabernacle with us! This also allows for 30 days of judgment and 45 days of wrath (between Daniel's periods of 1260, 1290, and 1335 days) between the Second Coming and Judgment Day. The odds against so many astronomical lineups (including others not mentioned here) occurring in the right order, the right number of days apart, on the appropriate Jewish holidays, on the appropriate days of the week - well, those odds are - ASTRONOMICAL. The odds of even one total solar eclipse ending at sunrise as seen from Jerusalem are so small that this will not happen again for many thousands of years. The alignment of the center of the galaxy and the winter solstice sun only happens for a few years once every 26,000 years. For Jupiter, Saturn, Venus, Mercury, Mars, the Moon, the Sun, and the galactic center to line up in position to act out the steps of the wedding ceremony and assume the arrangement known as "The Tree of Life" (which itself only has odds of happening once every 5-6 thousand years) - the odds are just too low for me to ignore that they all occur as the Bible describes near the end of 2019.